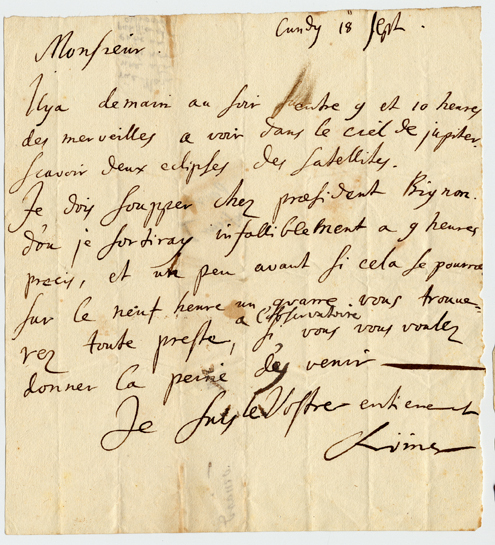 The document is written in French and states that after supper Rømer will proceed to observatory to watch the two eclipses of the moons of Jupiter. The addressee is invited to join him in his observations. The document is dated September 18th . scavoir deux eclipses des satellites. preste a l’observatoire, si vous vous voulez donner la peine d’y venir. Ole Christensen Rømer (1644-1710) studied under Rasmus Bartholin at the University of Copenhagen from 1662 to 1671. Between 1672 and 1681 he worked at the Paris Observatory, where he made the observations that led him to conclude that the speed of light was not infinite. Having returned to Copenhagen in 1681 Rømer took up the post of professor at the university, to which he had been appointed in 1676. In Copenhagen Rømer built observatories and made instruments (e.g. the meridian circle), standardised measures and weights, and saw to it that the calendar reform was introduced in 1700. G. D. Fahrenheit’s thermometer was inspired by one made by Rømer. He became chief constable and mayor of Copenhagen (1705). Among his acqaintances and correspondents in the scientific and scholarly community were Christiaan Huygens, G. W. Leibnitz, John Locke, John Flamsteed and Edmund Halley. The rivalry between J-D Cassini and Rømer is well documented. Rømer twice, in 1681 and 1699, married into the influential Bartholin family. Nicolas Toinard (Thoynard) (1629-1706) was a French antiquary proficient in ancient languages and a numismatist. He published a Greek concordance to the gospels and dissertations on Lactantius and Roman medals. As seen from Waller Ms dk-01906 he seems to have had some knowledge of cannons and guns. He was a friend of John Locke, whom he met in Paris in 1677. It was through Toinard that Rømer made Locke’s acquaintance. One of the other two documents in the Waller collection written by Rømer, Waller Ms dk-01906, mentions a hitherto unknown brother of the author. The other one is dated 1680, Waller Ms dk-01905.